I love cover homages. I love how they are used. I love why they are used. I love the feelings they bring up when they are used for effect. I love cover homages. 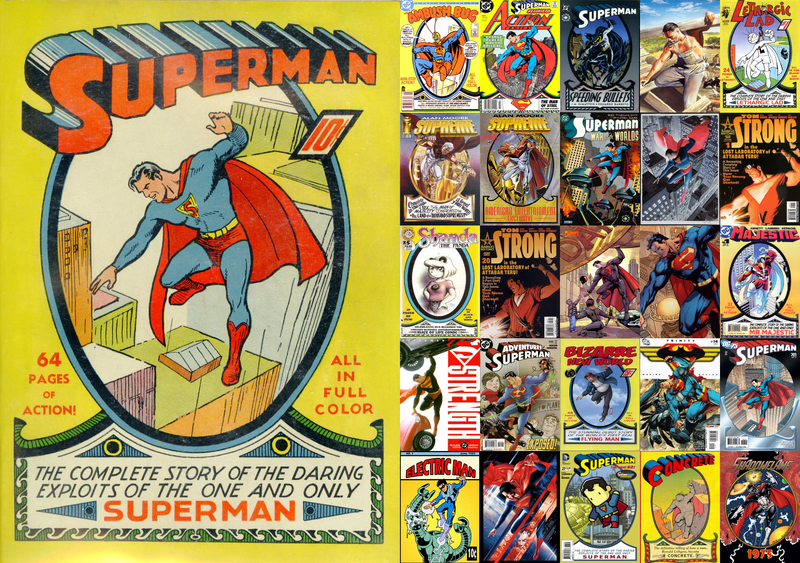 So when I posted the most recent Timeline Tuesday, I got it in my head to make a list of all the various homages to Superman #1 from 1939. I wanted to see how many I could list from memory and then I would double check my findings by doing a search online for others. I have notes either on paper or online of various cover homages, most notably for the first issue cover to the bwa-ha-ha Justice League by Kevin Maguire, so I’m always trying to update when I find new entries. Initially, my Superman #1 list only got up to around 8. Well, that list blew up to around 25+ images that either homage or evoke that first cover by Joe Shuster. The best thing I learned this time around is that the cover to Superman #1 is itself a direct “copy” from another comic. The image of Superman flying over a cityscape is a detail taken from a title image in Action Comics #10 (1939). As I was poking around, I came upon this post written up about Superman stamps created in Canada to celebrate the character’s 75th Anniversary. That post has the title image from Action Comics #10 that is the basis for the Superman cover. Check it out if you’ve never seen it before. That bit of comics knowledge alone was worth the time spent compiling my Superman #1 homage list. What follows is a more or less chronological display of the various covers that are specific homages or, at the very least, have similar design elements. I’m trying to stick to actual published comic covers and some interiors and not images that are fan art or sketches, etc. There are far too many of those to include. As always, feel free to leave a comment if you know of any that I have missed. And hit the image for a much larger view. ROW 1: Ambush Bug #1 (1985) by Keith Giffen; Action Comics #643 (1989) by George Perez; Superman: Speeding Bullets (1993) by Eduardo Barreto; page from Kingdom Come #1 (1996) by Alex Ross; and Lethargic Lad (1996) by Greg Hyland. ROW 2: Supreme #41 (1996) by Jerry Ordway & Joe Bennett; Supreme #41 variant cover (1996) by Jerry Ordway & Joe Bennett; Superman: War of the Worlds (1998) by Michael Lark; Superman 20th Century (1998) painting by Alex Ross; and Tom Strong #1 (1999) by Alex Ross. (And yes, I know that last one is a stretch. But what the heck). ROW 3: Shanda the Panda #25 (1999) by Mike Sagara & Mike Curtis (never heard of this comi); Tom Strong #20 (2003) by Chris Sprouse & Karl Story (again, a stretch. Plus, it’s an homage of a possible homage); page from Superman: Red Son (2003) by Dave Johnson, Andrew Robinson & Paul Mounts; page from Superman For Tomorrow (2004) by Jim Lee, Scott Williams & Alex Sinclair; and Majestic #1 (2004) by Ed McGuinness, Dexter Vines & Keron Grant. ROW 4: Superman: Strength #1 (2005) by Alex Ross; Adventures of Superman #640 (2005) by Karl Kerschl; Bizarre New World #1 variant (2007) by Christopher Provencher; Trinity #14 (2008) by Jim Lee, Scott Williams & Alex Sinclair (another slight stretch here); and Superman #701 variant (2010) by John Cassaday & Alex Sinclair. ROW 5: Electric Man #1 (2013) by Stuart Beel (no idea); Man of Steel poster (2013) by Martin Ansin; Superman #27 variant (2014) by John Katz; a Concrete promotional image by Paul Chadwick (from the 1990s I’m guessing); and Shadowflame by Joe Martino, Peter Palmiotti & Dash Martin (included more because it’s such an obscure character even though I believe it’s just unpublished art).